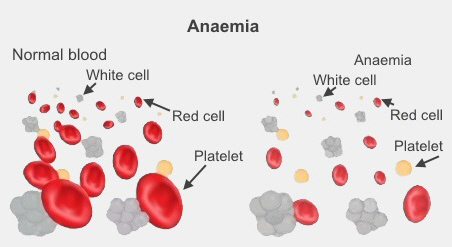 Anaemia is when you don't have enough red blood cells or they don't work normally. Red blood cells contain a protein called haemoglobin which carries oxygen from your lungs around your body. Red blood cells get old and break down, so you are constantly making a new supply of red blood cells in your bone marrow to replace them. A simple blood test called a blood count can diagnose anaemia, though it might not tell you what's causing your anaemia. If you have anaemia, you are likely to feel tired and faint, be breathless, look pale and feel your heart thumping (palpitations). These symptoms happen because there is less oxygen in your body. Many people have no symptoms, and their anaemia is picked up by a blood test. Many different things cause anaemia. Iron-deficiency anaemia, which is common, happens because you don't have enough iron. This can be because you are losing blood from somewhere, or just because you are low in iron. You also need folic acid and vitamin B12 to make red blood cells, so if you are low in these you can have what's called pernicious anaemia from vitamin B12 deficiency. More rarely your bone marrow doesn't make enough new red blood cells. Or you have a condition like sickle cell or thalassaemia, in which your red blood cells are fragile and break more easily in your bloodstream. This is also called haemolytic anaemia. If you are anaemic you may need more investigations to look for what's causing your anaemia. A simple blood test can check your iron levels and see if you are low in iron. Sometimes it may be obvious why you're low in iron, or you may need more tests to search for a cause. Talk to your doctor about what tests you need. Information about why your body needs iron, what causes iron deficiency and how iron deficiency is treated. Information about iron deficiency anaemia including its causes, symptoms, diagnosis and treatment. Written by HealthInfo clinical advisers. Endorsed by clinical director, Haematology, Canterbury DHB. Last reviewed July 2016.